A good year ago, an easily countable number of cards was laid out on the garden table, ready only for the weather to do its thing. With no weights protecting them against the wind, they were soon strewn pell-mell amongst pots, pebbles and chairs. Yet at the time, this appeared to be the right overture to a seemingly absolute obsolete task. The cards, even in their clumsy initial display, were of a striking perfection, a completeness usually attained by a radical but thoughtful succession of subtractions. Looking at them left you with an idea from which numerous others could be strung that albeit endless in their possibilities never contradicted your primary response. A bit like a merry-go-round on which you first spotted the comparatively oversized elephant. So the cards and images triggered their own perfect stories and rain and time seemed all they needed. And maybe an envelope. And maybe a little note. And maybe, a few maybes later, seduced by the thought that the obsolete beautifies the complete, something that would keep the tales running. Someone who would sit on the elephant and still see himself going round and round making a suggestion. Some relentless attention to possible displays and settings that would turn your initial story into an opening scene. Done so, you end up with a broadsheet full of first sentences from which to build stories built on stories about fish that are fish that are mirrors behind trees on trees on trees if you whack the gazelle. 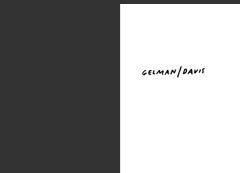 And safely before you reach a conclusion, you place it in an envelope together with a little note that reads: A good year ago, Gelman gave Davis a countable amount of his printed graphic work, initially only for the latter to leave his mark. With there being no way of subtly adding to the prints by scribbling over them, they were soon placed on tarmac, tables and chests. For at the time, this appeared to be the right overture to some beautifully arranged tales told by two. Design and Photograpny © Gelman/Davis 2004. New York and London.